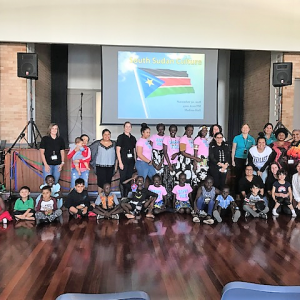 Community members Keth Duot and Debora Garang spoke at the event about the Dinka identity, culture and way of life. 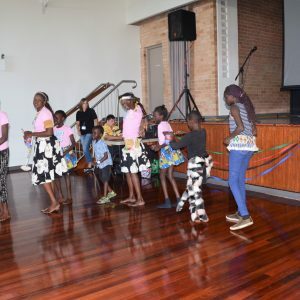 Deboras’s two teenage daughters also said some moving words about why sharing their culture is important to them in another country so far away from ‘home’. After listening to the powerful words, food was shared from Nubia Café and included traditional falafels, chicken stew and eggplants. Traditional LWOR dancing and dress-ups followed. 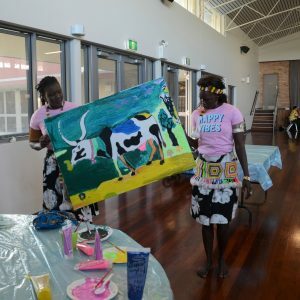 The community then worked together on an art piece of a cow, which represents Dinka culture and their devotion to cattle.